It isn't often that I want to facepalm when watching RT, but yesterday was one such moment. Serbia's new President just returned from Brussels, where he basically assured the Eurocrats he would continue the suicidal policies of his predecessor and EU/US drone, Boris Tadić. But Serbia doesn't have a new cabinet yet, so figuring out whether its policies will actually change remains a matter for speculation. I suppose RT thought it would be a good idea to bypass the political operatives and speak to a diplomat, whose job after all is to represent the country, regardless of who were in charge. After all, as English diplomat Henry Wotton once famously observed, an ambassador is a "honest man sent to lie abroad for the good of his country." So they interviewed Serbia's Ambassador to the UK, Dejan Popović. Now, in a normal country, their assumption would have been entirely warranted. But remember, this is Serbia we're talking about. And in post-2000 Serbia, the "good of his country" part was officially redacted from that observation, and replaced with "for the EU and the Empire." Two minutes on Wikipedia, or even the Embassy's own website, could have saved them the trouble. 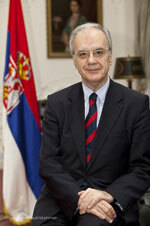 Popović, a former law professor, was Deputy Finance Minister in the 2001-2004 DOS government, and subsequently deputy chancellor of the Belgrade University. Before becoming ambassador, he was on president Тadić's "privy council." He may claim not to be affiliated with any party, but how plausible is that? In post-2000 Serbia, no one can get even menial jobs without party connections. Yet this man was a deputy minister, vice-chancellor of the country's biggest university, member of the president's inner circle and an ambassador, supposedly without any party pull. Not possible. The only question is only which party, the Democrats or the disgraced bankster G-17, which has now morphed into United Regions? Judging by the stupidities he spewed in the interview, it could be either. Supposedly the voters didn't care for the EU or Kosovo, but were "not satisfied with the performance of the economy." So that's how one says "you bastards ruined the country so badly, we're eating out of trash bins" in European, the language of the ruling quisling cult! More importantly, however, the only basis for his conclusion are the official election results. Which, let's remember, were absurdly unreal, doctored and tampered with. Anyone trying to make sense of them is wasting time, as they are nonsensical. The way Popović prattles on about the economy is simply offensive, as if Serbia magically woke up in its present predicament, and this development had nothing whatsoever to do with his Democrat-bankster bosses. Nope, must have been unicorns from outer space who indebted the country to 45% of the GDP, brought unemployment to 25%, and put the country in a position where there would be no choice but to "enter a very strict domain of austerity measures". That's rich, by the way, coming from a government that's grown in size even as it mercilessly suffocated every productive endeavor in the country. Božidar Đelić, Popović's direct superior in the DOS government, was nicknamed "the Flayer" (Derikoža) for the array of taxes he imposed upon the economy devastated by war and sanctions. Somehow I don't see the new Serbian government getting any smaller, lowering taxes on productive enterprises, or stopping the funding of soul-sucking NGOs. Oh yes, that's a pretty paradox right there, a government drowning the country in debt while giving 44 million Euros annually to fund the "non-governmental organizations" by and large focused on destroying the country from within! That's like deliberately infecting someone with AIDS, then feigning surprise that they are bleeding to death from Ebola. Asked whether it was feasible for Serbia to pursue EU annexation and stay friends with Russia, he gushed that it absolutely was. Why, such "very good friends of Russia, for instance Bulgaria or Croatia" were in the EU or about to join! Um, last I heard, both of those were members of NATO and Washington's obedient vassals. How did he figure they were "friends of Russia"? Is that like the "friends of Syria"? What about NATO membership? Oh no, no, Tadić said Serbia would be neutral, and the Constitution said Kosovo was part of Serbia. Surely no politician can disobey the Constitution, right? Or say one thing to his people and the other to the Empire? Right? The ambassador showcased the "depth" of his economic and political understanding by arguing that the EU was a lofty collection of noble values, which will outlast the economic and fiscal woes. He best not leave the kiddy-pool without a life vest. The EU was built on a promise of prosperity through welfare statism. Clearly, that concept is now collapsing - as is its American variation, prosperity through oligarchy and conquest. Which country is actually prospering, debt-free and trying to hammer out a new form of government that would guarantee the liberty of its citizens without devolving into teleoperated mob rule? You've guessed it: Russia. But the straw that broke the back of the proverbial camel was Popović's handling - or rather, mangling - of the Srebrenica question. Namely, president-elect Nikolić had recently told a radio show that Srebrenica was a horrific war crime, but not genocide - for which he was condemned by Bosnian Muslims, Brussels and Washington alike. The Ambassador had plenty of room to maneuver here. Nikolić did condemn the atrocity, and executing POWs is bad enough there is no need to gild the lily by defining it as "genocide." The ICJ verdict that keeps getting mentioned actually rejected the claim that "genocide" happened in Bosnia, and they only referred to Srebrenica as such because of a deliberate decision to take the verdicts of the ICTY (unlike the ICJ, an illegitimate court) at face value. Yet there is a growing body of level-headed evidence showing that the ICTY manifestly failed to prove the case for genocide in Srebrenica. Even the infamous parliamentary resolution promoted by the Tadic regime described Srebrenica as a "serious war crime", never mentioning the word "genocide." No serious diplomat would allow himself to admit to genocide, regardless of his personal feelings in the matter, and even if it were true (which, again, is very much debatable). Instead, Popović did just that, and even reinforced it by saying he ought to know, as a lawyer and law professor! For that alone, he should be sacked immediately. I don't know what RT was expecting out of the interview, but instead of getting a scoop on the new President's policies, what they got instead was a dollop of pabulum from the quisling regime still clinging to power, presented by a pathetic excuse for a diplomat who clearly cares more about the Brussels Reich than about his own country and people.